RollerCoaster Tycoon, originally created by the now-legendary developer Chris Sawyer, was released back in 1999 for Windows 95. The franchise has switched developers and publishers several times over its 17-year history, with seven published titles for PC, the Nintendo 3DS, and smartphones. The latest main entry in the series, RollerCoaster Tycoon World for PC, was a universally-disappointing game that was delayed several times in development. Earlier this month, “Atari” (or rather, whichever company is currently borrowing the Atari name) released RollerCoaster Tycoon Classic for Android and iOS. RCT Classic is essentially a slightly-remastered version of the original two RCT games. The game was developed by Origin8 (with Chris Sawyer listed as the Executive Producer), who also ported Chris Sawyer’s Transport Tycoon to mobile. As it turns out, RCT Classic might be the best RollerCoaster Tycoon game in years. All RollerCoaster Tycoon games follow the same basic gameplay. To start a new game, you must choose a scenario, which provides objectives for you to complete. Objectives can include reaching X park rating, achieving X company value, having X number of coasters, and more. Most scenarios include a time limit, such as completing all the objectives before Year 3. Once you complete a scenario by achieving all of the goals, more are unlocked to try out. RCT Classic includes 95 scenarios from RCT 1 and 2, so you’ll likely never run out of challenges. No matter what objectives you are trying to complete, you will have to expand and upkeep your park. Some scenarios start off with few or no rides already built, while others place you in an already-bustling park. Transport rides: Rides that transport guests around the park, such as the Miniature Railway. Gentle rides: Basic pre-built rides such as a Ferris Wheel, Merry-Go-Round, etc. Roller coasters: Many types of roller coasters can be built, including wooden coasters, junior coasters, and looping coasters. Each type has several pre-built designs that can be placed in the park, or they can be custom-built. Thrill rides: More pre-built rides, such as a large swinging pirate ship. Water rides: Rides involving water, like a log flume and rowing boats. Shops and stalls: Small buildings that are critically important for any park, including restrooms, information kiosks, and food/drink. As the park owner, you have to manage every single ride, shop, and stall. Tapping on a building opens a pop-up, with settings for operation (like minimum waiting times for rides), music playback, ticket prices, and more. You can also see what guests think of a certain building, which is critical to maintaining a high park ranking and a steady cash flow. For example, if many of your guests call your ride "a great deal," you can bump up the ticket price a small amount without most guests causing a fuss. Or if your guests are complaining about the price, you will likely have to lower it to keep a good park rating. 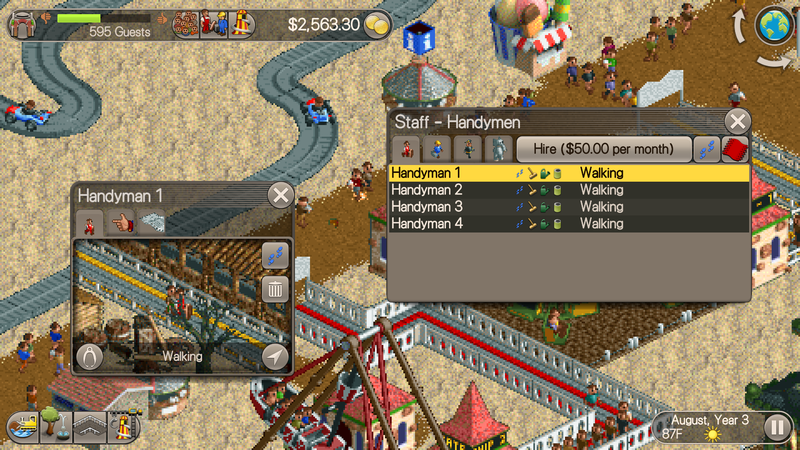 To keep your guests happy, you also have to manage your park's staff. Handymen (essentially janitors/groundskeepers) and mechanics are essential, but security guards and entertainers help a good deal. While you can manually move around your staff (as with park guests as well), you can also set areas where each staff member will roam. For example, hiring multiple handymen and setting separate areas for each to cover is critical for larger parks. If you've played any RCT game before, especially the first two entries, all of this will sound very familiar. That's because RCT Classic changes almost nothing in the move to mobile. The game's UI has been slightly tweaked for easier use on touchscreens, the ability to add custom music has been removed, and cloud sync is supported - but that's about it. Unfortunately, this also means some issues with the original games are still present, which I'll get to later. Simply put, RCT Classic looks identical to the original games. 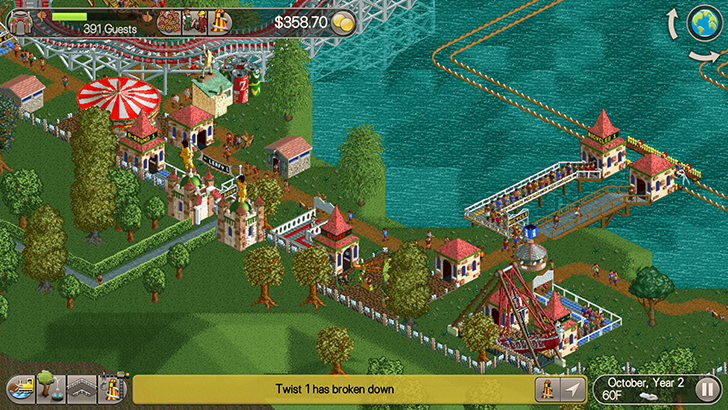 The game uses isometric graphics instead of true 3D to render your park, exactly like RCT1 and 2. It also uses original textures, so while your park might not look fantastic at maximum zoom, it retains the same design that RollerCoaster Tycoon fans know and love. The Isometric perspective didn't bother me too much while playing RCT Classic, but it does introduce limitations. You can only look at your park from four perspectives, which can sometimes become annoying when building complicated coasters. In addition, you cannot switch to a first-person perspective on rides like you can in RCT3 and later. RCT1 and 2 still hold up very well today in terms of graphics, and while playing RCT Classic, I never thought anything looked poorly-designed or desperately needed updating. 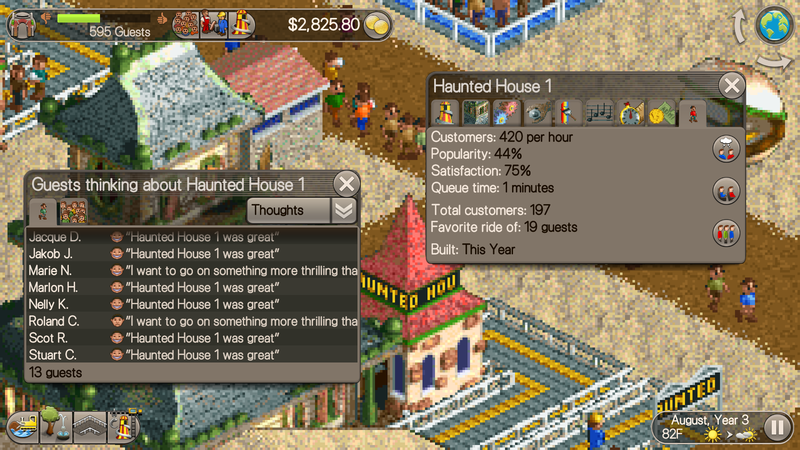 The largest issue I ran into was the buggy guest/staff AI. 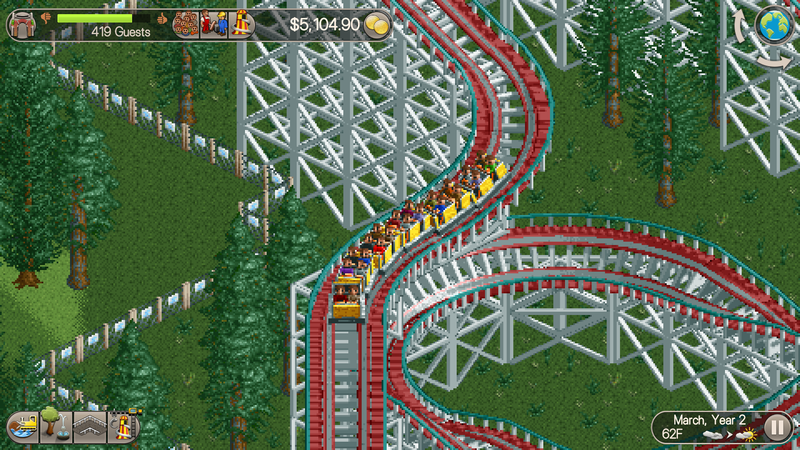 RollerCoaster Tycoon 1 and 2 have well-known issues with path-finding, causing guests to become lost very easily when the park's pathways are in any way complicated. This happened to me when I built a wide path at the exit of a ride, also causing the mechanic to be unable to fix the ride when it broke. This causes your park rating to quickly tank, which can often kill your chances of completing a scenario. Placing information booths all around your park, keeping path widths to 1 tile, and removing unnecessary paths will decrease the chances of this happening. In addition, I noticed a few mobile-specific bugs. For example, if I turn my Pixel's screen off while playing and turn it back on, the game turns into a black screen with no way to resume the game. Thankfully, the developers have already fixed several major bugs since the game's release. Wacky Worlds and Time Twister both cost $1.99 USD, and both include new rides, scenarios, and scenery for your parks. It should be noted that many of the new rides are re-skinned versions of existing rides, but I would say they are worth the cost. Toolkit costs $5.99 USD, and offers a park scenario editor, the ability to design custom coasters before adding them to a park, and an Import/Export tool. This allows you to share your parks and scenarios with other RCT Classic players, and you can even import most RCT 2 saved parks and scenarios. I'm not entirely sure if this is worth the asking price, but it's there if you want it. When I first heard 'RollerCoaster Tycoon Classic,' I assumed it would only be vaguely inspired by the earlier games and loaded to the brim with in-app purchases. Thankfully, Origin8 proved me wrong, and created a faithful port of RCT1/2 to mobile. Minus the few issues outlined above, this is a fantastic game and I would recommend it to any fans of simulation games or the RCT series.